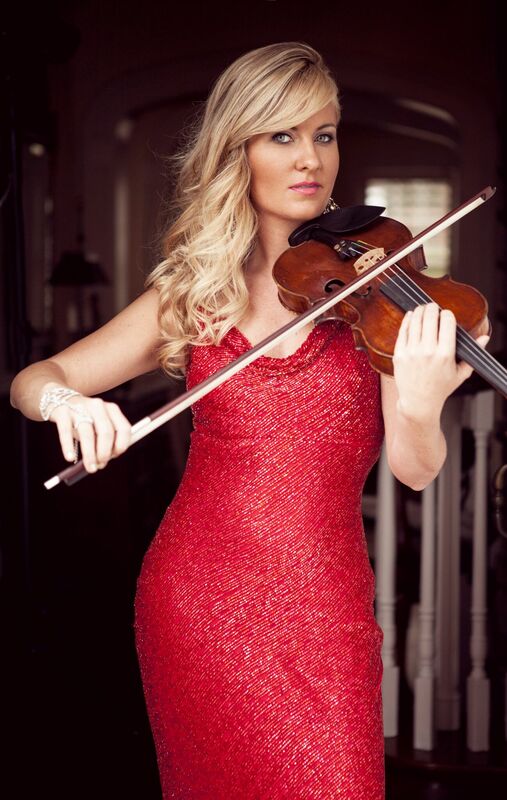 Known for her love of sparkle and bling, quirky laugh, and warm, genuine personality, world-class improv violinist and vocalist Rosemary Siemens has mesmerized audiences around the world since the age of three. Hailing from a century-family-farm in Plum Coulee, Manitoba, but currently based in Vancouver, BC, Rosemary is a small-town farm girl dominating the world-stage playing a 300-year-old violin named “Sparkle” that was played in King Louis XIV’s orchestra. She’s performed four times at New York’s Carnegie Hall, played private concerts for two U.S. Presidents and Canadian Prime Ministers, and 16-time GRAMMY Award-Winner David Foster, and was the first violinist to ever perform at the Sistine Chapel and St. Peter’s Basilica at the Vatican since its first mass in 1483. In addition to having recorded nine-albums as a solo-violinist, Golden West Broadcasting recently commissioned Canadian composer Victor Davies to compose a violin concerto for Rosemary entitled “The Journey”, which was performed by the Winnipeg Symphony Orchestra in a sold-out world premiere at Centennial Concert Hall. In August 2016, Rosemary’s hometown of Plum Coulee, Manitoba, unveiled a sign in her honour at the edge of the town that reads, “Plum Coulee, Home of Rosemary Siemens.” It inspired her to write, record, and release her debut bluegrass album titled, Plum Coulee, My Home, featuring her vocal debut accompanied by her band Rosemary & The Sweet Sound Revival. Since Rosemary’s album release in 2016, Plum Coulee, My Home, won “Best Country/Gospel Album of the Year” at Canada’s 2018 Gospel Music Awards, charted #11 on the Canadian Country-Music Sales Chart, won the 2016 Global Music Award for “Best Bluegrass/Country Album”, and was featured in Billboard Magazine. In March, 2017, Rosemary hit the road on her “Have a Little Faith” tour of Western Canada to promote her album, playing 11 shows in 10 cities including Vancouver, Winnipeg, Calgary, and her hometown area of southern Manitoba, where her boyfriend, now husband, award-winning jazz saxophonist Eli Bennett, interrupted her show by walking-down the isle while playing “Can’t Help Falling in Love With You” on his saxophone and proposed to her on stage in front of a sold-out audience. She said, “Yes!”, and the video of the proposal went viral and was featured on CBC National News, MSN News, and Yahoo. Since the 2017 launch of Rosemary’s U.S. radio-single “Barefoot ‘N Bling”, the single charted #9 for most-downloaded and streamed track, beating Garth Brooks and Eric Church and Rosemary is scheduled for a U.S. Radio tour in summer, 2017. The track features GRAMMY Award-winner Carl Jackson on banjo and the music video was filmed on Rosemary’s family’s century farm in Plum Coulee, Manitoba. Rosemary has performed in over twenty-five countries as well as the Vancouver 2010 Winter Olympics, Hockey Night in Canada, and concerts for Rolls Royce, Lamborghini, Bentley, Walt Disney World for Children’s Miracle Network, the Latin GRAMMY Awards, The Miss America Pageant, L’Oreal Paris, the World Entrepreneur Forum, the Egyptian Embassy in Washington, D.C., Canada’s Gospel Music Awards, and recently shared the stage in Nashville with gospel artist and 10-time GRAMMY Award-Winner CeCe Winans. Rosemary’s duo group “Roy & Rosemary” recently performed the world premiere of their composition, “The Courtial Concerto” written for the Ambassador of Rome at the world’s largest sacred music festival at the Vatican, and their music video of Leonard Cohen’s “Hallelujah” recently went ‘viral’ and has over eighteen million views on YouTube. In May, 2018, Rosemary had the honour to perform her “Path of Prayer” and share her story of faith in Ottawa at the 2018 Canadian National Prayer Breakfast for Canada’s Leaders and Members of Parliament. In addition to a demanding performing and touring schedule, Rosemary was recently featured as a star on the world-premiere of The Food Network’s new hit show “Chef In Your Ear”. She was also awarded the Queen Elizabeth II Diamond Jubilee Medal for her significant contribution to the arts in Canada. In August, 2018, Rosemary performed at the Harvest for Kids event in Winkler, Manitoba, where they received a Guinness World-Record for most-combines combining a section of land at the same time. Her song “Heavenly Harvest” was the theme song for the event and was recently nominated for a 2019 Gospel Music Award for “Country Song of the Year”. Rosemary’s passion is to take her violin everywhere – to unexpected locations to touch, inspire, and make people smile through music. From performing for passengers stranded at the Calgary International Airport during Christmas, to bringing a man to tears with a version of the classic hymn “Holy, Holy, Holy” at Rome’s iconic Colosseum, to taking song requests for a U.S. retired veteran at a Cracker Barrel restaurant in Nashville, you never know where Rosemary will show up to touch people with her music. You can follow her exciting adventures on social media at @RosemarySiemens.